Chalet Trail Becoming a Reality! 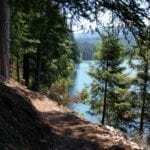 You can now do the complete loop of the Lake Siskiyou Trail. The temporary bridges are in place at the delta on the west side of the lake. They should be there until sometime in October. Happy Hiking!